Other: Pokemon: Pikachu, Kore Nan no Kagi? Diancie and the Cocoon of Destruction is the first Pokemon film in a while that features some fresh ideas and creative moments. In the vein of the last few, it's also an unambitious work stuck in a rut. Near the end of the film, there's a great scene with Ash and five antagonists awaking Yveltal. The ensuing attempts to kidnap Diancie and run away from the harbinger of death are joyously written. These scenes make only a tiny portion of the film overall, but they stand out from the cookie-cutter writing we're usually treated with in these films. The good thing about this one is that Diancie is a likeable character and her interactions with Ash & co are fun to watch. Of course, dialogue isn't going to win any awards, but I feel it's done its part. Adequate to keep us entertained, not enough to uplift the work. Diancie's lack of a distinguishing character arc is disapointing. While the whole thing ends up better than "We gotta get X", it still blundered a chance to make her a complex character. Her mini adventures aren't enough to keep us entertained for over two thirds of the film, either. It's for this reason that wacky sequences not fittingt the film are utilized to shake things up a bit. A good example of this is the infinite ladder at the mall. Just like Shaymin's film, this one suffers from a sudden focus shift from characters to the plot, where characters aren't developed enough for a character focused film and the plot is too weak to make itself worth it. The last fifth of the film with Yveltal petrifying the waking world is a joy to watch. However, Yveltal & Xerneas don't feel like world shattering legendaries because plot had no time to build them nor the legend around them. Unlike, say, legendary birds from the second film, these feel like pseudo-legendaries which only the local town folk are aware of as a curiosity. One thing that the film excels at are art and animation. The whole thing looks gorgeous and features some great, often subtle CGI. Anyone who knows the Pokemon movies knows that a lot of them are very formulaic, but most still appeal to fans in one way or another. 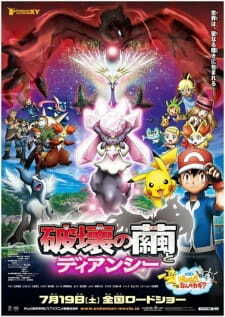 Diancie and the Cocoon of Destiny, however, is different, becoming most likely my least favourite Pokemon film yet. I watched the Cartoon Network broadcast of the movie, so perhaps that's the reason why, but this movie felt very hurried, and it lacked impact as a result. The story was very much to the formula of numerous other Pokemon movies. Meet new Pokemon -> Help it achieve its goal -> Uh-oh! Human baddies/Pokemon baddies -> Friendship prevails! This same old layout is usually remedied from being too boring by the individuality of the setting, Pokemon or enemies. However, Diancie's movie had no fully interesting setting, moving about across pretty same-y towns and areas, with only the Carbine tunnels being somewhat more unique. The bulk of the movie was comprised of a complete lack of action, with small, unsatisfying battles scattered throughout. This lack of action, however, provided the place for a few gags which were, to a degree, entertaining... But overall, the film just seemed boring and devoid of purpose. The end-game villain, Yveltal, appeared somewhat briefly towards the conclusion, and was quickly sent packing. Unlike other big-bad, such as the monster from Jirachi Wish Maker, Yveltal lacked a real sense of awe and excitement when it arrived, and was a disappointment that could have been cool. Oh, did I mention that Pikachu got turned into stone at the end? How absolutely original! The art was some of the best from a Pokemon movie. The use of CGI was nice, and the whole movie was attractive and stylish. The sound, as well, was fitting and quite good, including a rehash of the "Gotta Catch 'em All!" theme which surprisingly WASN'T terrible! The voice acting, the first of the English dub I've heard for XY, matched the characters and their original voices pretty well, especially Citron (or Clemont). Diancie's voice, however, became gradually more and more annoying, something that was only made worse by the overkill of flimsy dialogue about "bein frienz". The characters in the film were, in my opinion, one major reason this movie failed. The original characters could have been interesting, but even then, characters that drove the storyline were paper-thin and unmemorable. Supposedly important characters were barely introduced prior to the ending. Ninja Riot, for example, was a silly character who seemed to mock the whole idea of a ninja, and it was kinda funny... But, his seriously limited screen time held him back from being memorable beyond next week, no matter how ballin' his Ninjask flight was. Ash and his gang of above-par pals, Serena, Bonnie and Clemont, were as good as they usually are, and Team Rocket were there, despite having no real role. But that's not a change, now, is it? I didn't enjoy this movie nearly as much as I wanted to. The film had the potential to be exciting and radical, but instead was bland and uninteresting. If you want to watch just one new Pokemon movie, I recommend you wait until next year's ORAS movie - because, I mean, how can they mess up a movie about the Super Ancient Pokemon? Before I begin, I need to mention that this movie is probably not for everyone's tastes. You have to be a Pokemon fan to enjoy it. I'm writing this review and rating this movie in terms of how it compares to the other movies of the franchise. I should also add that the trailer was quite misleading as it had a number of scenes I didn't see in the movie. The story isn't anything too special, as it follows the typical formula of the Pokemon movies. Ash & co. meet Diance, a legendary Pokemon, whom they decide to help out. Diance is looking for Xerneas and its fairy aura, in attempt to become stronger so she can create the Heart Diamond. The current Heart Diamond is about to run out of power, which would cause the Diamond Ore Country to die out. Diance is the only one who is capable of creating a new Heart Diamond, but she 's currently unable to do so. In the meantime, there are different people, each working on their own, after Diance, trying to capture her because of her ability to create diamonds. This on-going conflict causes Yveltal's accidental awakening, which leads to Diance's eventual moment to shine. Unfortunately, the ending was kind of abrupt. There was no final battle between Yveltal and Xerneas like the trailer lead us to believe. It was quite anti-climatic, and left a "That's all?" feeling to me. It also has a few sequences that had potential to be more exciting than they were. Overall, I enjoyed the more light-hearted atmosphere it had for a good part of the movie, and the somewhat slice-of-life feeling with Diance experiencing the world she has never seen before (as she had only lived in the Diamond Ore Country) with Ash & co. I give the story a 6, because it was pretty decent overall, but the anti-climatic ending caused a disappointment. This might be the best Pokemon movie yet, in terms of animation. There isn't much to say about it other than the effects were beautiful, and the movie was pretty. The sound was, unfortunately, forgettable. While writing this, I can't really remember any part of the movie's soundtrack that I thought it was really cool in terms of music/sound. I also disliked the background music of the battle between Ash and the Ace Trainer, but I usually don't like the musical choices of the English Dubs so there is that. Sadly, I couldn't find an English Sub version of the movie to watch. I really like Ash's Kalos companions so this part was going to have a high rating from the get-go. The current Kalos group simply clicks together, and it really feels like a group of good friends traveling the Pokemon world. They are very like-able. Diance's character didn't disappoint me either, but I know other people found her weak and/or annoying. You'll have to watch the movie yourself in order to judge her character. Diance was behaving like the princess she is, which made things rather entertaining for me. She was also quite clueless about the world so that resulted in some funny moments. The rest of the characters, while they didn't have a lot of screentime, were also rather entertaining but are, sadly, somewhat forgettable. The movie was quite fun, especially after the disappointment of the last few movies. Alas, Movie 17 has it's fair share of flaws, and the anti-climatic ending was disappointing (especially after being mislead by the trailer). This is just my opinion of course, so I'd advice not to put your expectations too high. You may enjoy it as much as I did... or you might not really like it. The movie has flaws, but it was still enjoyable. The climax is very disappointing, unfortunately. This one was just a good movie in general. I feel almost like you could take out the Pokémon elements completely and still have the core story of an irresponsible princess growing up into a stronger person, and I really liked that. But on top of that, there was just a lot going on in this movie, and I think it worked here. There were four different treasure hunters/thieves on top of Team Rocket, and they actually all fit into this movie pretty well. I thought it was an especially nice touch that they each had one of the final evolved forms of the Kalos starters, rather than a more generically evil-looking, villain Pokémon. I saw this one after I'd finished the whole series, but this looks to have been set pretty early into XY, so it would have been really cool to see then. On top of that, each of our heroes had a place in this story, which doesn't feel like it should be a lot to ask, but there have definitely been Pokémon movies in the past where Ash is off being heroic, and his companions are just trailing along after him the whole time. In this movie, it really felt like they all came together to combat some great evil or threat, the way it should be. I enjoyed the music. The visuals were really striking in this one... I just finished the Volcanion movie earlier today and was pretty disappointed, so I was just really pleasantly surprised at what this one achieved. What is better? Dub Or Subs?